I love my adopted Native brother, Wolfs Robe. So much so that my profane side (residue I am sure from a stint in the Air Force) has concocted so many variations on his ceremonial name that I am confident that but not for our close relationship, that I would be in fear of my life or liberty. And I am gratified that he forgives me these attempts to humor myself and that he is also at home in front of the camera and behind the microphone, because I truly enjoy spending the time to make images of him. To make this image, we went out on the west side of Sedona at sunset; I brought a couple of lights. The first was a Quantum Q-Flash (one of my favorites) and a trusty Vivitar 285 (don’t laugh, it’s a great unit) for a kicker. I had not yet met Bruce Dorn — so I was not yet comfortable using Speedlights with light modifiers. Bruce was to enlighten me (so to speak) years later. Anyway, as I have begun to explore the world of HDSLR video, Wolf has been there as my subject and victim as I perpetrate my learning curve on him. 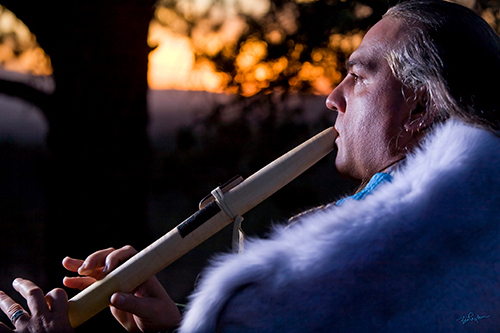 And once again, after a year, I surprised him by suggesting that we had enough tracks to allow him to offer to his fans a great DVD of him improvising on the Native American flute in the beautiful red-rock country of Northern Arizona. He agreed to release the DVD under the title of Red Earth. As winter approaches, we are planning to start a new video project — one where Wolf will go even farther off the beaten paths of Sedona in any weather to improvise on the flute. I can hardly wait to film him in the middle of Oak Creek in the snow as he attempts to trill his way out of the cold. In the meantime, he recently asked me to help him prepare a training video for the people who purchase his hand-made ‘granfather’ Native flutes. The first half is the care-of part, done in an intimate setting next to a stone fire place. The second half finds Wolf on the banks of Watson Lake. The next time I pick a location to film Wolf, I am going to pick a place with less distractions. All this time, I thought he was a true professional, literally playing in rain or shine. But there were no people around. The morning we set up at Watson lake, the locals were out in force, kayaking, picnicing and hiking. And being by nature a people person, Wolf was distracted. First you see it in his eyes, as they glance at the pretty girl kayaking past with her lab leading the way by swimming slightly ahead. Next there is a guy adjusting his trunks. Then there is … it doesn’t matter what! Finally he (as they say in show business) “went-up.” This expression means that he forgot what he was supposed to or was going to say and just sat there looking at the camera with at best a quizzical look on his face. As the frustration builds, he begins to verbalize his frustration. I don’t think that I will be coming out of retirement to be a life coach. But, on the other hand, how hard could it be? And, of course, what could possibly go wrong? I didn’t understand that an audience would bother him since he performs live at different locations.